In a remarkable career spanning over 30 years, Diana Ross has proven herself the consummate music artist as well as the most successful female singer of all time. In the 1960s as lead singer of the pop group The Supremes, she achieved the unprecedented feat of fourteen consecutive number one hit records, rivaling The Beatles for the position of most successful recording act of that generation. To the delight of her fans, both young and old, Ms. Ross returned to her roots and embarked on a national tour with The Supremes, Lynda Laurence and Scherrie Payne. The Return To Love Tour gave Ms. Ross the chance to perform the songs that seduced and dazzled an entire generation since she left the group in 1970. Her repertoire has covered popular music, the works of such diverse and legendary writers as Sam Cooke, Jules Stein, and Rogers & Hart, and when she made her film acting debut in 1972 portraying the late Billie Holiday in the film that won her an Academy Award nomination, Lady Sings the Blues, she also showed her extraordinary gift for jazz performance. Recently she has taken on the role of producer through her company Anaid Film Productions working for ABC, CBS, HBO and Showtime. She has also published her long awaited memoirs- Secrets of a Sparrow, authored by Ms. Ross herself. In her continuing commitment to helping children, recently, Ms. Ross joined the board of directors of A Better Chance, the oldest and only national program that provides a variety of educational opportunities to academically talented children. The organization, based in Boston, is best known for assisting inner city children in gaining access to the nation's top college prepatory schools. In addition, Ms. Ross is spokesperson for National Children's Day, a day in which children have the opportunity to share their hopes and concerns with America's leaders. 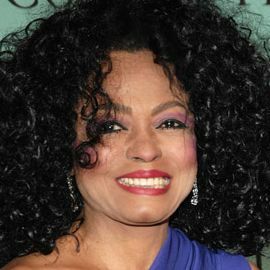 With an amazing capacity to combine many different interests and with a seemingly tireless energy, Diana Ross continues to be a leading figure for each generation. Singer and Actress; Plays Santana Lopez on "Glee"